Dodra Several Satsang samagams are being organised by 'Brahm Bunga Trust' in Punjab and other villages and cities. Now these samagams are being organised at various other places in India and abroad. Inspired by the true love and selfless service there is an increased enthusiasm to organize more and more such satsang samagams worldwide. How did this congregation(Satsang Samagams) start? What is special about this congregation? Who is the head or organizer of this congregation? It is difficult to answer such questions to complete satisfaction of each individual. Hence forth an effort has been made by this article (JAAN PECHAAN) to provide correct information about these satsang samagams organised by Gurudwara Brahm Bunga Sahib, Dodra. Since 1960, Jaswant Singh (Bauji) whose pen name is “Khoji”with cooperation from his retired colleagues from Burmese Army organized satsang samagams every month at various villages in Punjab. During 1976 Mataji Charanjeet Kaur from Malaysia, came to India in search of an illuminated soul (Gurmukh jan) and met Bauji. Since then she devoted herself in the service of sadh sangat .Gradually a number of people from these villages also started participating in these satsang samagams. Now such Samagams are being held every fortnight at different places as per the demand of the sangat in India and abroad. 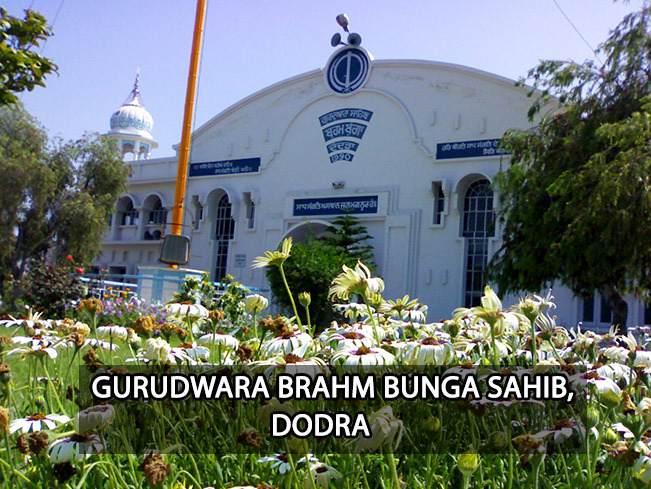 In India Gurudwara Brahm Bunga Sahib, Dodra, Dist, Mansa(Punjab) is the centre for such samagams. 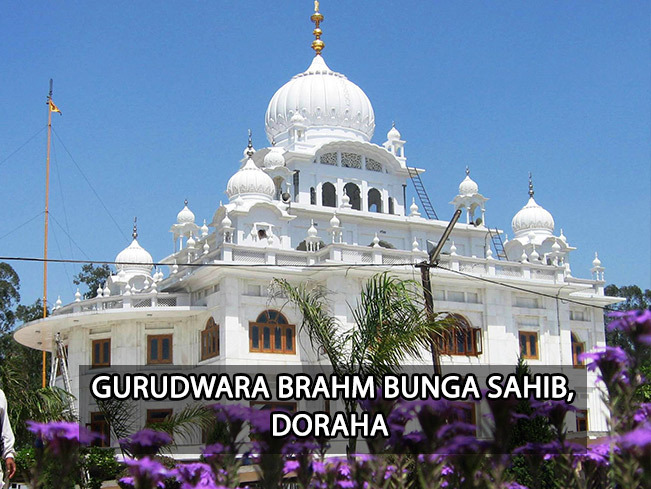 A new Gurudwara named Brahm Bunga Sahib, Doraha has also come up at Doraha, Ludhiana (Punjab) which is a branch of Gurudwara Brahm Bunga Sahib Dodra. The new Gurudwara sahib is located on Dakhni Bypass, Canal road and at distance of 4KM from Doraha and 20 Km from Ludhiana. Samagams are also being held with great love and devotion in various parts of the world. In the beginning for some years, samagams were held in the houses of a few retired personnel of the Burmese Army residing in Dodra village. Impressed by these Samagams, retired Subedar Kishan Singh, donated a plot of land for the Sangat in 1971 Satsang samagams were held for 2 years in a temporary structure. Gradually several rooms came up in the Gurdwara complex. In view of increasing sangat, Bauji with his foresightedness formed and got registered a governing body named Brahm Bunga Trust (Regd.) and the entire management was entrusted to the trust. In sangat coming from numerous cities and villages of Punjab and other states of India, Gurudwara buildings were also enhanced as per requirement. A new huge diwan hall has also been constructed. There is an adequate arrangement for the boarding and lodging of the sangat during the period of samagam. GURU KA LANGAR is always served. "Kahibae Ko Sobhaa Nahee Dhaekhaa Hee Paravaan"
Therefore, we seek the presence of all aspiring souls to come and seek the blessings of Guru Saheb and experience the love of Gurbani and sadh sangat during these samagarns. Now after Bauji and Mataji, Gurudwara Brahm Bunga Trust is performing the service of holy congregation (satsang samagams).